Today I was featured in this list of 'world class women achievers'. (along with the likes of Kiran Bedi and Anoushka Sharma). It was indeed a pleasure and an honour to have been chosen. I do get many mails from many women who tell me they find my life inspirational. My life does sound like a 'perfect-fairy tale' to so many people out there. So I thought I will write a post to tell you about the grit behind the glamour, about the struggle to get where I am today. This article is mainly for the women readers out there. (though men are welcome to read and/or comment too!). Several years back, I made a conscious choice to quit my corporate career and be a stay-at-home mom. It was indeed a very difficult choice because, ever since I was a child, it was my dream to be financially independent. I was certain I would have a corporate career and rise to the top. That was all I ever wanted. But when I became a mother, I changed in ways that I never thought possible. I wanted to be there for my children and no way was I leaving them in someone else's care. So I had to kill that dream (of a corporate career with financial independence) , because I couldn't have both--I couldn't have a career as well as be a full time mom. 'Nothing but the best for both my children. after all if I have quit my career, I am going to be the best mother that I can be,' I had decided. But it wasn't that easy. (I made a choice and I breastfed both my children for one and a half years each. I had read up several studies and articles about how breastfeeding increases children's IQ by several notches. Click here to read one such from the Scientific American.) Firstly the demands of a baby are round the clock. You get no respite, no off, no free-time. Also, if you are breast-feeding, your diet has to be adequate. You have to eat enough and very nutritious food in order to be able to produce the required quantity. And oh--the pain! Breast-feeding is bloody hard! You have to be there all the time, around the baby. For me it was very hard. But I stuck to the decision because that was what I wanted at that point in time. In the initial five years of both of our children's lives, I don't think Satish and I have ever eaten a meal together. We have raised our children, all by ourselves--with no help from anyone. (Satish had lost his mom long before I got married to him and my mom's health did not permit her to stay with us to help look after). Also Satish had a job which involved a lot of travel and so most of the time I was alone. While I did enjoy my children immensely, any parent knows how demanding child care can be. You have to be alert 24x7. You have to be there all the time. There are so many days when I wouldn't even have had time to have a bath till late evening, and sometimes only when Satish came from work would I even have time to shower. I read to my children a LOT. (It has paid rich dividends now. Both are avid readers). I did a lot of 'brain games' with them. I did a lot of activities, which required them to be creative and required them to think. I discovered that I was naturally good with children. When my son was one and a half, I got an offer to teach in a pre-school. My condition to them, was that my son should be allowed to join me. They had no issues with that and I used to take him with me and drive to work. I really enjoyed my job and the stimulation my son recieved from so many children was something fantastic. When he was two and a half, I shifted him to another pre-school (as I didn't want him becoming too dependent on me) and I continued to teach there, till I had my daughter. Once I gave birth to my daughter, I teamed up with a good friend and we started running 'thinking workshops' for kids, twice a week as an after-school acitivity. There was nothing of the kind at that time, and the parents as well as the children absolutely loved it. The children who used to attend our workshops didn't want to go home! They were that much fun and the amount of stuff they learnt and were exposed to was phenomenal. Satish's job was a transferable one and soon we moved to Pondicherry. Again, they saw how good I was with children and they offered me a teaching job in my children's school which I accepted. Then we moved cities again. After we settled down, I started Art classes for children and they were really well received. There used to be a long wait-list to join my classes. I also used to do my own 'summer camps' for children, offering them experiences which they never had before. I also did several workshops for children for some international schools. One of the International schools offered me a teaching job (with excellent pay) but before I could accept, Satish's career required us to move again, this time to Pune. So I had to again give up my dreams and put whatever I wanted to do, on hold. I felt very bad about it. But again made a choice to put my family before my career. I was the rock for my family.Satish will happily admit that his career would never be where it is today (he is in the senior management in an MNC) had it not been for my full and complete support. (His job involved a LOT of travel and I managed the home and both kids always, all on my own--never have I grumbled as it was a choice I made). I was always there for the children when they came back from school. I have never employed a cook, as I am finicky about cooking for my family. Satish and I cook all the meals together. To this day I have a problem with the term 'housewives'. They are definitely not 'house-wives' they are home-makers. That book (Life is what you make it) continues to be in top ten on the Nielsen list. After that I wrote ' tea for two and a piece of cake'. That book was among the top five best-selling Indian fiction of 2012. 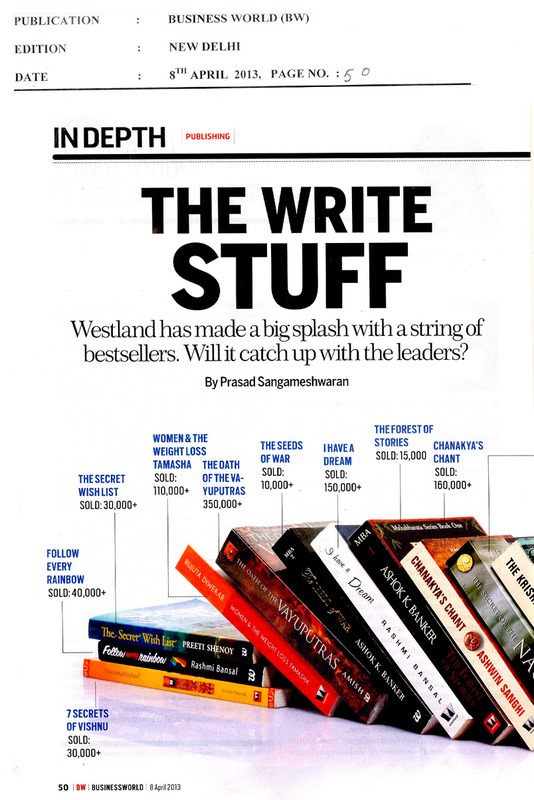 My fourth book 'The secret wishlist' has broken all records. It is just three months since it has been released. It finds a mention in the latest issue of Business World. For me, what it means more than anything else, is that my words reach thousands and thousands of people and have an impact on their lives. I get mails from thousands of people telling me how my writing has changed their lives. I feel grateful for the gift. My children are now 15 and 12 (nearly). I am able to work really hard at my writing as they are pretty independent. Now I am able to travel for my events, as they can manage well without me. They are so darn proud of all that I have achieved, as is Satish who is one of my biggest supporters and he will happily declare that he is my biggest fan. Now finally, my long cherished dream of being financially independent (which I thought I would never be able to achieve) has come true too. So, if you are a stay-at-home mom, feeling bad about giving up your dreams, your interests, have hope. Children grow up. The time that you spend with them will never come back. Nurture your interests side-by-side and do not quit doing that one little thing which you do for yourself, which gives you joy. (In my case it was working with children initially, and later writing). Hold on to it. Nurture it. Protect it. It is easy to forget it in the daily rigours and demands of parenting and running a home. Have hope and believe in your dreams. CONGRATS! I am very happy for you and also the fact that you inspire hundreds and many thousands of women. I love the candor with which you are able to write about your life and the choices you have made, the struggles you have come past and now looking back, it is clear that everything in life has just made you stronger, better and happier. The choice to be came from within you all along. Regarding where you mention about housewives versus working women, there is a side to this which perhaps you may not be familiar with. I chose to be a working mom and there is no end to the snubs, the veiled insults and social snobbery that I have deal with almost on a daily basis from friends, acquaintances and evern those whom I personally know. The choice to work, whether as a home maker or a working woman, both bring its share of pains, struggles and milestones. As a working woman, I see the flip, ugly side of how the society behaves to put you down and destroy your confidence and at your end, you have experienced it too. What I mean to say is this, no matter what choices we make, we cannot find everyone who is happy and pleased for us. There will always be taunts, insults and put downs. The choice to move ahead of all this as you have rightly done - that is what makes all the difference. All the best for your forthcoming book too, Preethi. God bless. Who snubs you and puts you down and why?! (asking as I am genuinely curious) I would imagine that a working woman at least has financial independence, as she earns her own money, unlike a stay-at-home mother or homemaker who has to depend on the guy for money! To me that is a lousy choice--to depend on someone! Honestly if satish wasn't the kind of guy he is, I would have run back to work long back! A working woman gets paid, she gets promotions, bonus, recognition, rewards--unlike a stay-at-home mom who gets NOTHING! The only validation a stay-at-home mom or a homemaker gets, is what comes from within. That does not mean life is easy for a working woman (as I am now a full time working woman too). Working does come with its own set of challenges an stress--but my point is at least you get paid!! You don't have to ask the husband for those high-heels you want to indulge in. I truly do not believe that one is better than the other. One should do what makes you happy. Only if you are happy can you spread the happiness. I have been silently and sincerely following your blogs and books.This post is genuinely inspiring.All your posts are so real as they come straightly from your heart.Even I had to quit my career(2 times,once from IT and once from banking) just to take care of the kids as I never ever got any help from elders.I am still a homemaker (who works round the clock but never got the privilege to be addressed as working mother/women)This is the choice I made and I am happy with it. There is one thing you said so boldly which I found on the offensive side.The "stay-at-home gets NOTHING" is really something that I can never understand.I never look at it that way as I count my blessings everyday in my kids kisses,hugs,kind words,love and affection.To decide to take care of the family is not the same as "to depend on someone".Its actually "them" who depend on us for everything,most importantly for their happiness.Its ME they look for,the minute they come home.My smile makes their day...whether its hubby or the kids.My hugs take their stress far away...I feel honoured to do these duties .My presence at home gives me more rewards that cannot be counted but only felt where as my presence in a firm may not give me this kind of satisfaction.Who wants those luxuries that fade away in future when I have the luxury of having many sweet memories each day which will never ever fade away.Love being a 24/7 mom. PS:This doesnt mean I will stop nurturing my dream (of learning classical dance which means everything for me).One day...for sure...! I have never said 'stay at home mom gets nothing"!!! In fact my whole post is completely contrary to that! Glad you do not view it that way and glad you get immense satisfaction from your husband's and children's smiles! Good luck with your dreams! I so agree on the "home maker" part. My mom has always been one. So while other girls might have had ambitions of climbing their career ladders, all I wanted to do is be a "Homemaker". I realise the importance of my mom being at home 24*7 for us! and that is what I had decided for myself a long time before marriage. As long as you are happy--that is all what matters. The story of how you became an accomplished writer is definitely an inspiring one. A woman, whatever choices she makes, is always judged by society. If you have a full-time corporate career, you are made to feel guilty about your kids, your home, etc. If you are a homemaker, your contribution is neglected. If you have a part-time job, you are made to feel as if the organization is doing you a favour. Ultimately, it is up to the individual to decide what's best for her and where her interests lie. Of course, as you have rightly pointed out, the husband plays a very important role. Wishing you all the very best always. May you continue to inspire millions across the world! Thank you so much. But the thing here is women should *not* feel guilty for the choices they make! I could relate with the 'Housewife mentality' still running in the society! Many dont understand how difficult it is to stay at home(in the initial years of the child's life v r almost stuck at home! )after being a busy office goer(i missed the getting-ready ritual and going out in to the world and meeting loads of people,all in a day).. I was kidding about the 'perfect fairy tale' life :) Yes--I agree about not being able to go out and meet people and it is really tough. It is important to not regret later which is why interests have to be nurtured. Else you will find your children grown and your life empty. This was such a great read.. I have read 2 of your books.. Yet to catch up on the rest. Wish you the best! I like your zest in life.. Thanks a lot Lakshmi. Wishing you the very best! Yes--a corporate ladder may not always take you to where you want to go :) It is important to enjoy the ride! This write up generates a lot of positivism,,there is a saying in tamil called patience is bitter but the results that it yields is even sweeter...One can say that its true in your life..
hi mam nice blog..i was a very ambitious person right from my childhood..did my best in schools n college..i am a doctor anaesthesiologist..a mother of two too..right now in a struggling phase taking care of 2 kids..my mom and in-laws r busy with their own lives..scared of losing touch with my skills on one hand and thinking of children on the other..i was always a person who used to make things happen..hardworking and very busy..not used to household chores..now my world has turned topsy turvy..revolving around kids cooking and home..entirely a new role..i enjoy it but sometimes miss my career and busy life..ur blogs r really inspiring...this one has really given me lots of hopes n positive vibes...love ur writing.. Thank you so much bobby and I am glad my writing resonates with you. Yes, a world revolving only around kids can be hard. Do cultivate and nurture a hobby or some interest. I guess what Swapna (the first person to comment) meant was that when ur a working woman, people sometimes tend to judge u and say u are selfish. They blame u for ignoring ur children or leaving them to strangers' care. And sometimes parents don't want to appoint a nanny cuz they cant trust a stranger. So some parents send their kids to grandparents; who might be living in an entirely different city, state , country or even continent. I have seen many people do that. And that is also a very very tough decision for them. Today's women are so torn between being a full-time mom or a career woman. Our mothers had it easy, cuz there was a support system - grandparents were healthier, unemployed and there were many younger aunts and uncles. But its really hard for the women of our generation. If we don't work, then we are considered useless. If we work, we are considered selfish. And there are very very few women who can do justice to both - they are either super smart, super women or very very lucky! :-) I don't know if its harder for the women of our generation--I think we are privileged. And about sending kids to grandparents--will blog my thoughts on that some day! Thanks Vishal :) I just did what I wanted to at that point. Never thought about courage and other stuff. It was a hard choice to make really. I've had a corporate career too since past 6 years, but have quit now after the birth of my son. I loved your post especially the inspiring words in the last paragraph. Thanks you soumya and I am happy you found it useful. lovely , inspiring ,quintessential for women!!!!!!!!!!!!! My mother has been a home maker, and now when she looks back there are times which make her feel at a loss for all that she had to give up. She is an anesthetist by profession, a money minting business and also very stressful. But, she loved her job and tried real hard to work even with a few years off in between. But, things never worked out and it all the more depends on your husband. Like you say, if the person who you are married does not make you feel proud of what you do, things do go for a toss. Presently my mother is extremely adamant that I should work, and now that my daughter is going to be 2 years , she feels now is the time to get back. Its a very difficult decision for me as I had consciously decided I will be there for her always till she is able to express herself and let me know of any issue. In a way I do believe that the time has come, but there is a pull which is real strong preventing me from getting back but I know that for me the financial independence and freedom is extremely important. I see how my life has changed after I have stopped working, and in a way I do not even see myself having a conversation which does not involve child rearing as a topic, if not directly , for sure indirectly. I have this very strong urge to change that and be involved in an activity which is completely away from my home making duties. These are the things which I want, and seeing how my mom feels after these years, I do not want to be there. But, getting there and being happy is the next step to it. Very hard choices to make Aathira. And in the end only we can decide for ourselves as only we know what makes us tick. This post should be read by each and every person who nurtures a Dream. You know Preeti I keep coming back to reading some of your posts - I find them so motivating and inspiring ! Thank you so much! Honoured! The post spoke to me....especially the last paragraph, told me there's hope....HOPE. I've told you this earlier also Preeti...many of your posts have made a difference to the way I think now. And there's a lump in my throat preventing me from saying more:-). Hey Preeti.. I totally agree with you.. on the point that working mothers get more credit. I am just 25 and have my one year old. I have a one mother in law who can look after my son very well. Still I insisted to stay with my son for at least 1 year so that I can breastfeed him exclusively. I knew it that this time would never come back and I so wanted to be with him. But, during those period people used to constantly ask me.. why don't you work? Why do you want to stay home? and what not... even they used to tell such things to my mother-in-law. This was all I faced.. I felt bad..
Later I got a good offer and I took it.. when my son is happy.. but I still work for a part-time kind and spend the maximum possible time with my son. I love to be with kids and I think I am good at that.. Thanks for sharing.. something so beautiful. I feel we women folk need to respect each other's choices and judge less. We are indeed privileged and have come a long way from just a couple of generations ago.....we should focus on the positive evolutionary trends and keep them going to make the choices for the next generation much much easier. Lovely post and sharing of your journey....and very inspiring too! Love n hugz! Such a well written post , almost have a lump in my throat. This has been your MOST inspiring post for me, at this stage in my life :) Thank you! Really nice post.Actually all of your posts are very inspiring.Yours was the first blog that I started reading. And I still remember it was when I was really having a bad day. And from then on every time I second guess myself I come back to your blogs and I find something which convinces that I am right and I should keep going. I even started blogging but could not post more than one blog. Not due to laziness or because I don't like writing but because its too personal. One shares a lot knowingly or unknowingly while blogging. Don't you get scared about being judged? That was my question number one. Question number two was what are these thinking workshops. How did you get an idea about it? What you did in these workshops?where did you get the material from? I have a daughter who is six and I really would like to do these with her in summer break. Its not urgent and I know you are very busy but I will really appreciate if you could find some time and write about the workshops. It was a great post. You are one inspiring lady. That was great post. You are one inspiring lady. Like Sheetal, i also would like to know what are thinking workshops. Also, did moving from town to town affect your children due to change of schools/friends..
Just to know as we have been thinking of shifting.